The Foxes boss feels he is beginning to put his stamp on Leicester after a comfortable victory over Bournemouth. Jamie Vardy was also on the scoresheet to give new Foxes boss Brendan Rodgers three wins from his four matches in charge. Vardy passed his century of goals in all competitions for Leicester last week. Vardy has scored 101 goals in 262 games for Leicester. 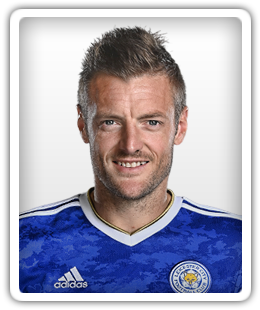 Vardy has scored 12 goals for the Foxes this season after passing his century against Fulham. Vardy passed a century of goals for the Foxes in a comfortable win against Fulham. The 35-year-old joined Leicester in 2012 and is out of contract in the summer. Extra security will stay at Rodgers' house in Scotland until his family leaves. Rodgers' family home in Scotland was targeted by burglars. Foxes fought back to level terms through Jamie Vardy but conceded a late goal to lose. Jamie Vardy has scored just nine goals for Leicester this season. The former Celtic manager's first time in charge will be against Watford on Sunday. New boss Rodgers was in the stands as the Foxes secured three points. The former Celtic and Liverpool boss has agreed a three-year contract at the King Power Stadium. Vardy said he was struggling to adapt to Puel's tactics this season. Spurs warmed up for their Champions League showdown against the Bundesliga leaders with a hard-fought win over Leicester. Sergio Aguero enjoyed another fine, but not perfect, afternoon. The Leicester striker was filmed apparently upset Puel was speaking to Paul Pogba after the defeat to Manchester United.